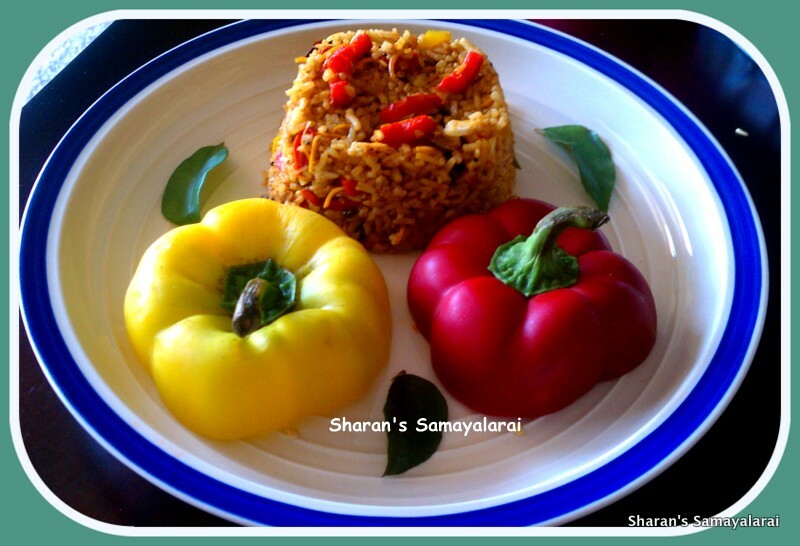 Capsicum Rice is an ideal lunch box dish, which looks colorful and delicious. The ingredient list may be long, But it is quick and easy-to-make dish made with a combination of Indian spices. Fresh crunchy capsicums, masala flavor and crunchy cashews jazz up the taste of the rice dish. * Roast the ingredients listed above to golden brown and powder. 1). Wash and chop the bell peppers. I have used muti color bellpepper to give a colorful look to the rice. 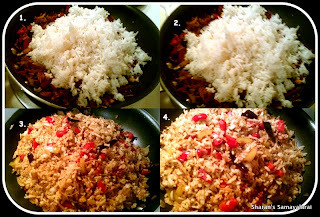 Cook the rice in a way that each grain should be separate, add a tsp of ghee to the rice and combine. 2). In the same pan, add oil/ghee and once its hot, add mustard seeds and let them splutter. Add the urad dal and channa dal and fry till golden brown. 3). Add the Red chillies, chopped Onions and cashews and saute till it turns light brown. Then add diced capsicums and fry them for approximately 3 minutes. Don’t over cook them, let the capsicums retain their crunchy texture. Add salt to taste and combine well. 4). Now at the low flame, add the grated Coconut, ground masala powder, salt. 5). 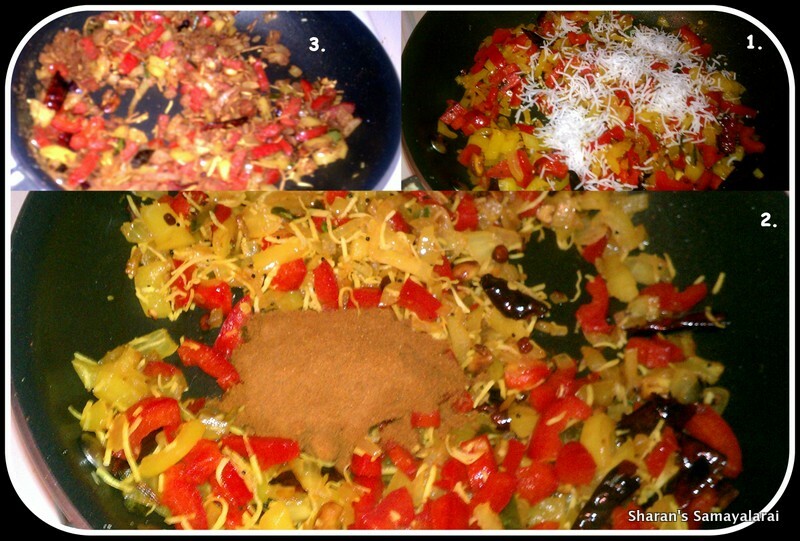 Reduce heat and add the cooked rice and combine with the spice mixture. 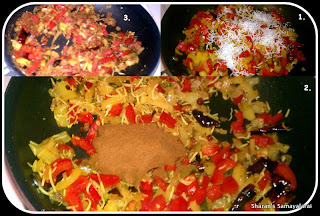 Stir gently but evenly that the rice gets mixed well with the Bell pepper mixture. 6). Serve hot with any gravy curry of your choice or with just pickle, yogurt and Papad. Makes a complete meal ! 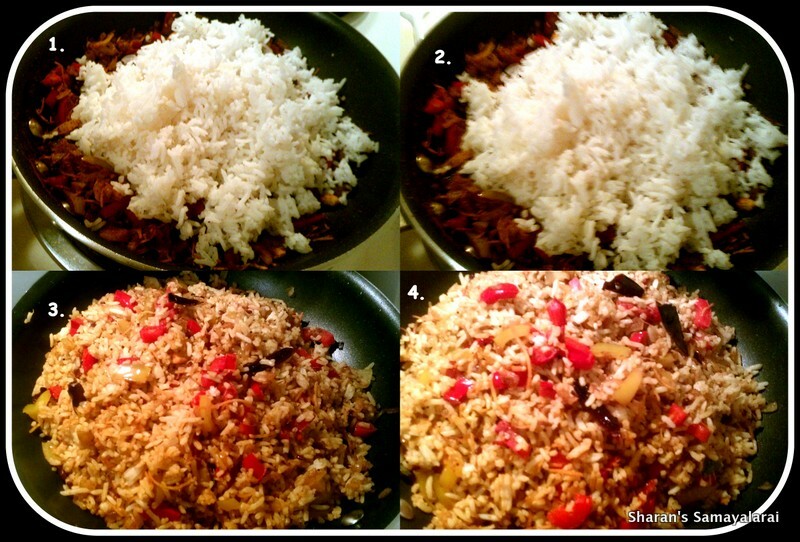 A lovely healthy rice dish, that goes with just about anything, or nothing at all! # This rice can be prepared using other vegetables like carrots, potatoes, gherkins, egg plants, bitter gourd etc. # The Peanuts/Cashews really brings out the flavor, so don’t skip this step. 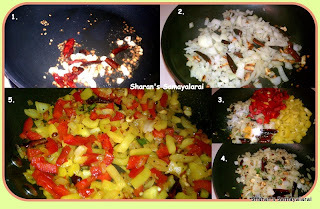 # Handful of chopped onions with Capsicum adds more flavor. # For colorful preparation, use different colors of capsicum. # Extra cheese can be added for the children. * Adjust the spice mix according to your taste.